On 15 September, 1952 VMC-1 was commissioned at K-3 airbase in Korea with both an AEW and ECM mission. At its standup the squadron was assigned only one aircraft, a two seat AD-2Q that had been previously operated by the small ECM section of the MACG-2’s HEDRON. That basic aircraft was equipped with ECM receivers capable of intercepting the Russian or Chinese supplied radars that the North Koreans were suspected of operating but came with no direction finding equipment. During the previous year an APA-17 Direction Finder was added to the ECM suite with in house modifications performed by MSgts. Bouher and Grimes, two veteran electronics technicians and pioneer ECM operators. The main problem with the AD-2Q was it could accommodate only one ECM operator and training had to be conducted on the ground using an ECM test bench with single generators. Lt. Col Fox, the new CO of VMC-1, was faced with a daunting training challenge while deployed in the middle of a war with ever increasing need for tactical ECM assets. He was soon to be assigned other AD aircraft including a couple of three seat AD-4N or AD-4NL variants but they still only had one ECM station. All had to be modified with the APA-17. Since there was no CONUS pipeline of trained ECM operators, he had to establish a crash course for newly assigned enlisted aircrews, many coming over from F7F night fighter squadrons as they were transitioning into the F3D-2 jets. At the same time he was expected to conduct combat ECM missions. Shortly after the squadron stood up an AD-4NL was assigned and the CO was briefed on a plan to modify it to accommodate two ECM operators that would help alleviate a major training problem. This modification plan, put forth by TSgt Dan Georgia, the most experienced electronics technician and ECMO in his squadron, was readily accepted. Georgia went to Itami, Japan with the AD-4NL BuNo 124745 to commence the mod program with the support of Marine Aircraft Repair Squadron -17. The modification would provide an APR-9 receiver for one operator and the other an older APR-4. The two positions shared an APA-11 signal analyzer and the APA-17 direction finder. An existing homing antenna system and crude pulse analyzer was retained but seldom used. The ARC-1 communications transceiver was relocated to make room for the ECM gear in the crew compartment and numerous wiring modifications were required. 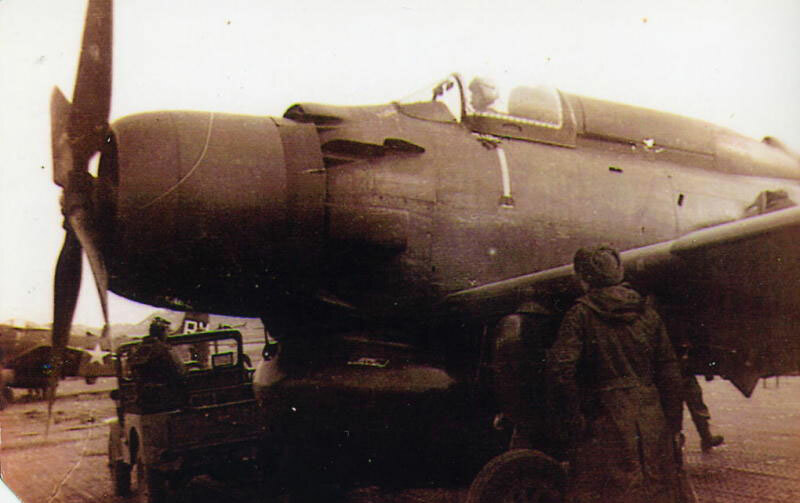 The wing mounted APS-31 radar pod was removed as the intent was for passive operations only. The configuration designed by Georgia allowed the flexibility of one operator to operate all the equipment as needed. Although not part of the original plan, Georgia had a LORAN navigation set and a tail warning radar installed. The poor LORAN coverage in Korea prevented it from being used as intended to get more accurate positions for radar direction finding. Later that Fall, Georgia returned to K-3 to finish the mods and complete testing with the assistance of the MAMS-33. The first test flight was on 17 November, 1952 with Capt. Gordon Keller Jr. as pilot and mechanic TSgt. Charles Canter joining Georgia as the crew. The following day Capt. Keller and TSgt. Georgia flew the first combat mission near Wonsan harbor in what was now RM-1. This aircraft became the prototype for modification of other AD-4N/NL aircraft flown by the squadron. MCARA member Don Kincart was the plane captain for RM-1. TSgt. Georgia was awarded a Bronze Star for his design and modification work allowing inflight training in support of 1st MAW combat operations. Unfortunately, RM-1 was lost in March, 1953 when Capt. Keller and MSgt Donald Smith were forced to make an emergency wheels up landing on Chodo Island. With the aircraft receiving strike damage, Georgia led a team to the site to salvage some equipment and burn the aircraft.